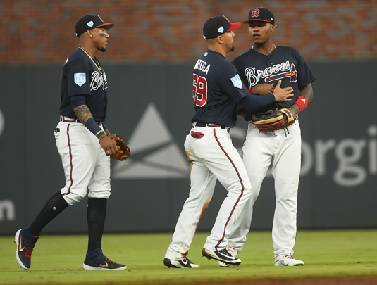 From left, the Atlanta Braves' Johan Camargo, Rafael Ortega and Cristian Pache celebrate after an exhibition baseball game against the Cincinnati Reds on March 25 in Atlanta. Atlanta Braves prospect Cristian Pache, currently with Double-A Mississippi of the Southern League, is one of the top 100 prospects in minor league baseball. The Mississippi Braves, Atlanta's Class AA affiliates, are playing at AT&T Field earlier than they ever have before. Mississippi's lone journey to Chattanooga the past three years has occurred in August, and that's when many of Atlanta's top prospects have advanced past Double-A and when this area's passion for football at all levels relegates minor league baseball to a secondary interest. That's not the case this year, as the M-Braves will be in town tonight through Friday night. "This is definitely new for us," Lookouts president Rich Mozingo said. "People have asked me for years whether we compete against the Braves, and I've always said that when the Braves are good, we are better. It just helps when people are talking about baseball, and to have them coming in now is great for us. "There will be a few more people walking around our ballpark in visiting team stuff for the next five days." 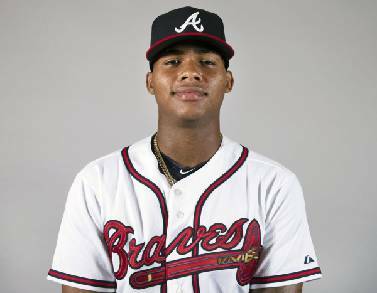 Mississippi's roster includes one of Atlanta's stars of spring training, 20-year-old center fielder Cristian Pache from Santo Domingo in the Dominican Republic. The 6-foot-2, 185-pounder entered this year as a top-100 prospect in all the minors, ranking No. 35 on MLB.com's preseason list and No. 85 on Baseball America's. 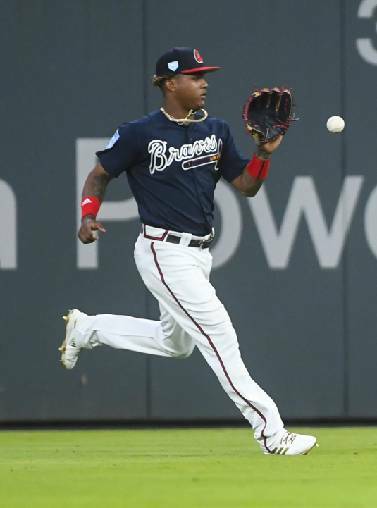 Having signed with the Braves as an undrafted free agent and received a $1.4 million signing bonus in July 2015, Pache spent the 2017 season with Single-A Rome and hit .281 in 119 games with 42 RBIs and 32 stolen bases. He began last year in the high Single-A Florida State League and was promoted to Mississippi, where he hit .260 in 29 games. "Pache might be the best defensive outfielder in the minor leagues," MLB.com wrote in its top-100 ranking. "Once he gets to the big leagues, he'll immediately join a list of elite-level centerfielders." Both MLB.com and Baseball America posted their lists before spring training, when Pache played in 24 big-league exhibition games and hit .359 with 10 home runs and 10 RBIs. He enters tonight hitting .313 through the first eight games of the Southern League season. Another elite Atlanta prospect, pitcher Ian Anderson, has made two starts with Mississippi and is 0-0 with a 3.24 ERA with 10 strikeouts in eight innings. The No. 1 pick of the Braves in 2016 is scheduled to start Tuesday night's game. The only other series this season between the Lookouts and Braves takes place in Mississippi on Labor Day weekend. "We work on so many different restraints in getting our schedule together that we never really discuss the opponents," Mozingo said. "These ballparks now have so many different events programmed in their facilities. The Braves would be the only team we would talk about, but we never talk about opponents when it comes to the schedule."